Newly elected Massachusetts 3rd district Congresswoman Lori Trahan has a warm smile and comes across as intelligent, charming, and poised. As a former chief of staff to Congressman Marty Meehan, Trahan also brings a dimension of Capitol Hill experience not typical of your usual breathless freshman Congressperson. 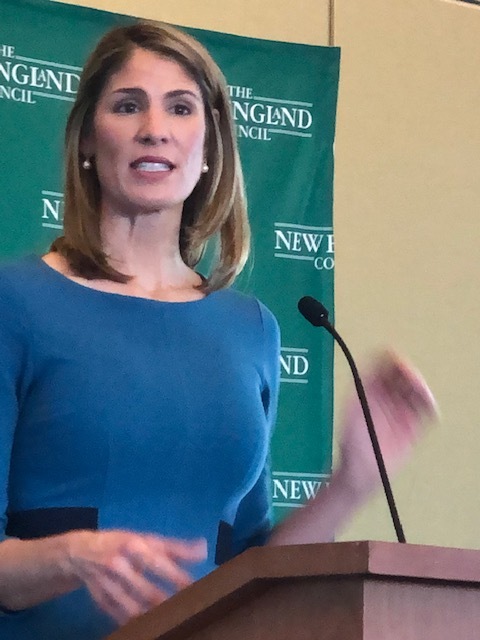 She spoke yesterday for the first time to The New England Council, the region’s leading business-oriented organization. Trahan says she is committed to helping young people develop the technical, analytic and social skills to benefit from the opportunities generated. This means encouraging collaboration between community colleges and corporations to prepare students for the proverbial good jobs at good wages, but also addressing the ever-burgeoning student debt load (an aggregate $1.5 trillion in debt), which has tripled since the Great Recession. Trahan’s life story comprises a range of experiences that make her relatable, starting with federal workers struggling to survive during the government shutdown. Her father was an iron worker and her mother, a domestic. Her family lived paycheck to paycheck.Her grandparents were immigrants, and she was the first in her family to graduate from college, which she attended thanks to a volleyball scholarship. After graduating, she worked in government but moved into the private sector, where she worked for a marketing software company and then led a small, women-owned consulting firm. She said she was inspired to run for Congress by her two daughters – Grace, 8 years old, and Caroline, who proudly tells all she is precisely 4 3/4 – for whom she wanted to set an example. As Trahan returns to Washington for her first meeting of the Armed Services Committee, she conveys seriousness of purpose and readiness for the challenges ahead. Despite this newcomer’s being listed as 427th in seniority, Lori Trahan is, as pundits like to say, one to watch. This entry was posted in Politics, Uncategorized and tagged divisions among Democrats, federal workers held hostage, former Cong. Niki Tsongas, House Armed Services Committee, MA Congresswoman Lori Trahan, Speaker Nancy Pelosi, The New England Council. Bookmark the permalink.